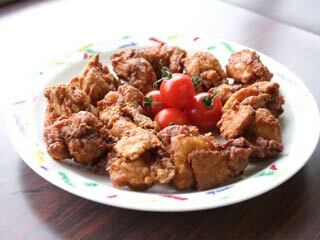 "Karaage" is Japanese Style Fried Chicken. It is flavoredwith soy sauce, ginger and garlic. One of the popular food for lunch box, dinner and Izakaya food. Most of the time, it uses chicken but, you can use pork or beef as well. First, cut chicken for a little bit bigger than one bite size. Remove the meat into a bowl, and add sake and salt little. Let's make a flavor for Karaage. Slice a half piece if garlic and mash it. Add Sesami oil about 1 scoops. Use towel or kitchen paper to dry the chicken and dip it into the sauce. Mix them and leave them about 15 min. Add oil on a big pan. The temperature of the oil will be 170c. Oil is ready, let's fry them. Add little flour over the flavored chicken, and fry them. It's cooked well whe it has this orange color.